Tom Spataro (L) with DCI Executive Director Dan Acheson. Each year Drum Corps International awards Director of the Year honors to corps leaders in both the World and Open Classes. 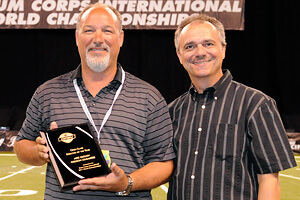 The 2011 Dr. Bernard Baggs Leadership Award—named for the longtime judge and DCI Board of Directors adviser—is given annually to the outstanding World Class director of the season as determined and voted on by corps directors. 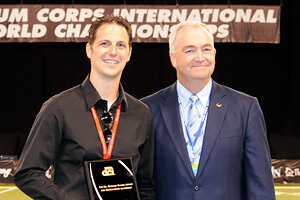 The 2011 recipient is Tom Spataro, Executive Director of the Boston Crusaders. Humbled by the honor, Spataro learned he had received the award just a short time before he would accept it on the field at Lucas Oil Stadium during the World Championship Finals on Aug. 13. "It was a huge surprise—I got a call 30 minutes before it was delivered. I actually thought they were calling me because there was something wrong with the corps!" Spataro said. "This is an incredible honor voted on by my peers, and it's an honor for me to be selected." Spataro was named executive director of the Boston Crusaders following the 2007 DCI summer season. Prior to spending several years as part of the corps' management team, he was a baritone-playing member of the corps and served as Boston's drum major in 2000 and 2001. Over the last year, Spataro has served as one of six members of the DCI Board of Directors. His corps had a strong season in 2011, scoring over 90 points at the World Championship Finals for just the sixth time in the corps' history. Mike Quillen (L) with Open Class Coordinator David Eddleman. Voted on by all Open Class directors before the end of the season, the 2011 Open Class Director of the Year is Mike Quillen of the Oregon Crusaders. As director of the Oregon Crusaders since 2009, Quillen says that in 2011 the corps saw its largest growth in membership and talent. With a sixth-place finish his first year on the job, the corps jumped to second place in 2010, and just missed capturing a gold medal by three tenths of a point this past August. "We have a solid program here in Oregon," Quillen said after his corps received the silver medal at the Open Class Finals on Aug. 9 in Michigan City, Ind. "At almost 60 percent, we have a good return of membership from year to year which is really good in this activity." Quillen, who previously served on Oregon's brass staff two years after his oldest daughter Jennifer joined the corps, says he has had a lot of help from others within the organization to help him lead the corps to where it is today. "As the only drum corps in Oregon right now, I didn't see [this recognition] coming," said Quillen. "We're kind of isolated and in our own little bubble here, so I was pleasantly surprised to be nominated." Outside of his involvement with the drum corps, Quillen works for IBM as a senior program manager in storage development. He and his wife LuAnn have three children. Quillen's youngest daughter Jessica is currently the baritone section leader and a five-year member of the Oregon Crusaders. The 2010 Directors of the Year were Dann Petersen of the Madison Scouts and Rick Odello of Blue Devils B.